A German sixth chord on the last beat of m. 96 in Scott Joplin's "Binks' Waltz" (1905). Conventionally used with a predominant function (resolving to the dominant), the three more common types of augmented sixth chords are usually called the Italian sixth, the French sixth, and the German sixth. The interval of the augmented sixth normally resolves outwards by semitone to an octave. The augmented sixth interval is typically between the sixth degree of the minor scale, ♭ , and the raised fourth degree, ♯ . With standard voice leading, the chord is followed directly or indirectly by some form of the dominant chord, in which both ♭ and ♯ have resolved to the fifth scale degree, . This tendency to resolve outwards to is why the interval is spelled as an augmented sixth, rather than enharmonically as a minor seventh (♭ and ♭ ). Although augmented sixth chords are more common in the minor mode, they are also used in the major mode by borrowing ♭ of the parallel minor scale. There are three main types of augmented sixth chords, commonly known as the Italian sixth, the French sixth, and the German sixth. Though each is named after a European nationality, theorists disagree on their precise origins and have struggled for centuries to define their roots, and fit them into conventional harmonic theory. According to Kostka and Payne, the other two terms are similar to the Italian sixth, which, "has no historical authenticity-[being] simply a convenient and traditional label." The second movement of Beethoven's Piano Sonata in F♯ major, Op. 78, begins with an Italian sixth chord. The Italian sixth (It+6 or It6 or ♯iv6) is derived from iv6 with an altered fourth scale degree, ♯ . This is the only augmented sixth chord comprising just three distinct notes; in four-part writing, the tonic pitch is doubled. The Italian sixth is enharmonically equivalent to an incomplete dominant seventh. 3) is similar to the Italian, but with an additional tone, . The notes of the French sixth chord are all contained within the same whole tone scale, lending a sonority common to French music in the 19th century (especially associated with Impressionist music). This chord has the same notes as a dominant seventh flat five chord and is in fact the second inversion of II7♭5. 5) is also like the Italian, but with an added tone, ♭ . In Classical music, however, it appears in much the same places as the other variants, though perhaps less often because of the contrapuntal difficulties outlined below. It appears frequently in the works of Beethoven,[a] and in ragtime music. The German sixth chord is enharmonically equivalent to a dominant seventh chord though it functions differently. The ♭ can move to either or , thereby generating an Italian or French sixth, respectively, and eliminating the perfect fifth between ♭6 and ♭ . In major modes, ♭3 can be enharmonically respelled as ♯ if it resolves upwards to ♮ , similar in voice leading to the resolution of French sixth to the cadential six-four. Other variants of augmented sixth chords can be found in the repertoire, and are sometimes given whimsical geographical names. For example: 4–♭6–7–♯2; (F–A♭–B–D♯) is called by one source an Australian sixth. Such anomalies usually have alternative interpretations. 5, vi7 or their parallel equivalents in the minor mode) leading to a dominant chord. This movement to the dominant is heightened by the semitonal resolution to from above and below (from ♭ and ♯ ); essentially, these two notes act as leading-tones. This characteristic has led many analysts to compare the voice leading of augmented sixth chords to the secondary dominant V of V because of the presence of ♯ , the leading-tone of V, in both chords. In the major mode, the chromatic voice leading is more pronounced because of the presence of two chromatically altered notes, ♭ and ♯ , rather than just ♯ . In most occasions, the augmented-sixth chords precede either the dominant, or the tonic in second inversion. The augmented sixths can be treated as chromatically altered passing chords. Augmented sixths as dominants in C major, according to Tchaikovsky. Notice the early resolution of an inner voice to avoid parallel fifths in the last example. In the late Romantic period and other musical traditions, especially jazz, other harmonic possibilities of augmented sixth variants and sonorities outside its function as a predominant were explored, exploiting their particular properties. An example of this is through the "reinterpretation" of the harmonic function of a chord: since a chord could simultaneously have more than one enharmonic spelling with different functions (i.e., both predominant as a German sixth and dominant as a dominant seventh), its function could be reinterpreted mid-phrase. This heightens both chromaticism by making possible the tonicization of remotely related keys, and possible dissonances with the juxtaposition of remotely related keys. Tchaikovsky considered the augmented sixth chords to be altered dominant chords. He described the augmented sixth chords to be inversions of the diminished triad and of dominant and diminished seventh chords with a lowered second degree (♭ ), and accordingly resolving into the tonic. He notes that, "some theorists insist upon [augmented sixth chord's] resolution not into the tonic but into the dominant triad, and regard them as being erected not on the altered 2nd degree, but on the altered 6th degree in major and on the natural 6th degree in minor", yet calls this view, "fallacious", insisting that a, "chord of the augmented sixth on the 6th degree is nothing else than a modulatory degression into the key of the dominant". The example below shows the last nine measures from Schubert's Piano Sonata in A major, D. 959. In m. 352, an Italian sixth chord built on scale degree ♭ functions as a substitute for the dominant. Augmented sixth chords are occasionally used with a different chord member in the bass. Since there is no consensus among theorists that they are in root position in their normal form, the word "inversion" isn't necessarily accurate, but is found in some textbooks, nonetheless. Sometimes, "inverted" augmented sixth chords occur as a product of voice leading. Rousseau considered that the chord could not be inverted. Seventeenth century instances of the augmented sixth with the sharp note in the bass are generally limited to German sources. The excerpt below is from J.S. Bach's Mass in B minor. At the end of the second measure, the augmented sixth is inverted to create a diminished third or tenth between the bass and the soprano (C♯–E♭); these two voices resolve inward to an octave. In music theory, the double-diminished triad is an archaic concept and term referring to a triad, or three note chord, which, already being minor, has its root raised a semitone, making it "doubly diminished". However, this may be used as the derivation of the augmented sixth chord. For example, F–A♭–C is a minor triad, so F♯–A♭–C is a doubly diminished triad. This is enharmonically equivalent to G♭–A♭–C, an incomplete dominant seventh A♭ 7, missing its fifth), which is a tritone substitute that resolves to G. Its inversion, A♭–C–F♯, is the Italian sixth chord that resolves to G.
Classical harmonic theory would notate the tritone substitute as an augmented sixth chord on ♭2. The augmented sixth chord can either be (i) an It+6 enharmonically equivalent to a dominant seventh chord (with a missing fifth); (ii) a Ger+6 equivalent to a dominant seventh chord with (with a fifth); or (iii) a Fr+6 equivalent to the Lydian dominant (with a missing fifth), all of which serve in a classical context as a substitute for the secondary dominant of V.
All variants of augmented sixth chords are closely related to the applied dominant V7 of ♭II. Both Italian and German variants are enharmonically identical to dominant seventh chords. For example, in the key of C, the German sixth chord could be reinterpreted as the applied dominant of D♭. Simon Sechter explains the chord of the French sixth chord as being a chromatically altered version of a seventh chord on the second degree of the scale, . The German sixth is explained as a chromatically altered ninth chord on the same root but with the root omitted. The tendency of the interval of the augmented sixth to resolve outwards is therefore explained by the fact that the A♭, being a dissonant note, a diminished fifth above the root (D), and flatted, must fall, whilst the F♯ – being chromatically raised – must rise. 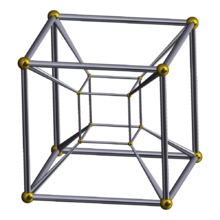 A tesseract. The diminished seventh chords occupy points on two diagonally opposite corners. Starting with a diminished seventh chord, lower any factor by a semitone. The result is equivalently to a German sixth chord. From the German sixth chord, lower any factor by a semitone so that the result is ancohemitonic (i.e. : possesses no half steps). The result is a French sixth chord or minor seventh chord possibly posing as a virtual augmented sixth. From the French sixth chord (or minor seventh chord posing as augmented sixth), there exists a factor which, when lowered by semitone, gives a result equivalent to a half-diminished seventh chord possibly posing as a virtual augmented sixth. From the half-diminished seventh chord as augmented sixth, there exists a factor which, when lowered by a semitone, is equivalent to a diminished seventh chord at the interval one semitone lower than the diminished seventh chord which started the sequence. Three repetitions of the above complete the cycle in modulo-12 note space, forming a necklace of three tesseracts joined at opposite corners by diminished seventh chords and subsuming all 12 notes of the chromatic scale. The minor seventh chord may also have its interval of minor seventh (between the root and seventh degree (i.e. : C–B♭ in C–E♭–G–B♭) rewritten as an augmented sixth (C–E♭–G–A♯). Rearranging and transposing, this gives A♭–C♭–E♭–F♯, a virtual minor version of the German sixth chord. Again like the typical +6, this enharmonic interpretation gives a resolution irregular for the minor seventh but normal for the augmented sixth, where the two voices at the enharmonic major second converge to a unison or diverge to an octave. The half-diminished seventh chord is the inversion of the German sixth chord. Its interval of minor seventh (between root and seventh degree (i.e. : C–B♭ in C–E♭–G♭–B♭) can be written as an augmented sixth (C–E♭–G♭–A♯). Rearranging and transposing, this gives A♭–C♭–D–F♯, a virtual minor version of the French sixth chord. [need quotation to verify] Like the typical +6, this enharmonic interpretation gives a resolution irregular for the half-diminished seventh but normal for the augmented sixth, where the two voices at the enharmonic major second converge to a unison or diverge to an octave. ^ Notable examples include the themes of the slow movements (both in variation form) of the opp. 57 ("Appassionata") and 109 piano sonatas. ^ a b Benward, Bruce and Saker, Marilyn (2009). Music in Theory and Practice, Vol. II, p.105. Eighth edition. McGraw Hill. ISBN 9780073101880. ^ Andrews, Herbert Kennedy (1950). The Oxford Harmony. 2 (1st ed.). London: Oxford University Press. pp. 45–46. OCLC 223256512. ^ a b Aldwell, Edward; Schachter, Carl (1989). Harmony and Voice Leading (2 ed.). San Diego, Toronto: Harcourt Brace Jovanovich. pp. 478–483. ISBN 0-15-531519-6. OCLC 19029983. ^ Gauldin, Robert (1997). Harmonic Practice in Tonal Music (1 ed.). New York: W.W. Norton. pp. 422–438. ISBN 0-393-97074-4. OCLC 34966355. ^ Christ, William (1973). Materials and Structure of Music. 2 (2 ed.). Englewood Cliffs, NJ: Prentice Hall. pp. 141–171. ISBN 0-13-560342-0. OCLC 257117. Offers a detailed explanation of augmented sixth chords as well as Neapolitan sixth chords. ^ Kostka & Payne (1995), p.385. ^ a b c Rimsky, p. 121. ^ Blatter, Alfred (2007). Revisiting Music Theory: a Guide to the Practice, p.144. ISBN 978-0-415-97440-0. "One may note that the French sixth contains the elements of a whole tone scale commonly associated with French impressionistic composers." ^ Benjamin, Thomas; Horvit, Michael; Nelson, Robert (2008). Techniques and Materials of Music: From the Common Practice Period Through the Twentieth Century (seventh ed.). Belmont, CA: Thomson Schirmer. p. 165. ISBN 978-0-495-18977-0. OCLC 145143714. Beethoven frequently moves from one form of the chord to another in such a way, sometimes passing through all three. ^ Burnard, Alex (1950). Harmony and Composition: For the Student and the Potential Composer. Melbourne: Allans Music (Australia). pp. 94–95. OCLC 220305086. ^ Kostka, Stefan, and Dorothy Payne (1995), Tonal Harmony, third edition (New York: McGraw Hill): p.384. ISBN 0070358745. ^ Piston, Walter; Mark DeVoto (1987). Harmony (5 ed.). New York: W. W. Norton & Company, Inc. p. 419. ISBN 0-393-95480-3. ^ a b Tschaikovsky, Peter (1900). "XXVII". In Translated from the German version by Emil Krall and James Liebling (ed.). Guide to the Practica Study of Harmony (English translation ed.). Leipzig: P. Jurgenson. pp. 106, 108. ^ Roberts, Peter Deane (1993). Modernism in Russian Piano Music: Skriabin, Prokofiev, and Their Russian Contemporaries, p.136. ISBN 0-253-34992-3. ^ Rousseau, Jean Jaques. Dictionnaire de Musique. ^ Ellis, Mark (2010). A Chord in Time: The Evolution of the Augmented Sixth from Monteverdi to Mahler, pp. 92–94. Farnham: Ashgate. ISBN 978-0-7546-6385-0. ^ Ernst Friedrich Richter (1912). Manual of Harmony, p.94. Theodore Baker. ^ Satyendra, Ramon. "Analyzing the Unity within Contrast: Chick Corea's Starlight", p.55. Cited in Stein. ^ Sechter, Simon (1853). Die Grundsätze der musicalischen Komposition (in German). Leipzig: Breitkopf und Härtel. ^ Ouseley, Frederick. A. Gore (1868). A Treatise on Harmony, pg. 138, Oxford, Clarendon Press. ^ Tymoczko, Dimitri. A Geometry of Music: Harmony and Counterpoint in the Extended Common Practice (Oxford and New York: Oxford University Press, 2011), pg. 106. ISBN 978-0-19-533667-2. ^ a b Ouseley, Frederick. A. Gore (1868). A Treatise on Harmony, pg. 137, Oxford, Clarendon Press. ^ Ouseley (1868), pg. 143ff. ^ a b Christ, William (1966). Materials and Structure of Music, v.2, p. 154. Englewood Cliffs: Prentice-Hall. LOC 66-14354. ^ Hanson, Howard. (1960) Harmonic Materials of Modern Music, p.356ff. New York: Appleton-Century-Crofts. LOC 58-8138. ^ Benward, Bruce, and Marilyn Nadine Saker (2008). Music in Theory and Practice, vol. 2, p.233. Boston: McGraw-Hill. ISBN 978-0-07-310188-0. Rimsky-Korsakov, Nikolai (1886). Practical Treatise on Harmony (13th – 1924 ed.). St. Petersburg: A. Büttner. Piston, Walter (1941). Harmony (co-author Mark DeVoto 5th – 1987 ed.). New York and London: W. W. Norton & Company.